A loop of beads is a likely candidate for the earliest form taken by early prayer beads or paternosters, several hundred years before the rosary devotion as we know it today was invented around 1450. But there are few enough early examples that it's impossible to say what "THE" earliest beads were like: whether they were a plain loop of identical beads, a loop of small beads with larger gauds or marker beads, a straight string of beads, or some other form. Quite likely there were several popular forms at the same time. 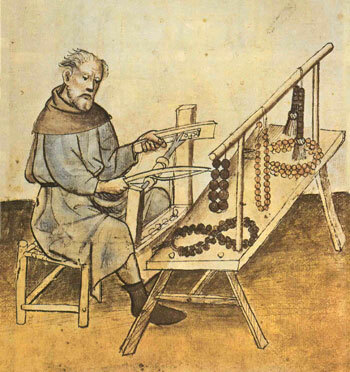 At left we have the well-known picture of a paternoster maker, or "paternosterer" (from the Stadtbibliothek in Nurnberg), using a simple bow-driven lathe to make large round beads — by their color, probably wooden ones. Hanging on the rail above the table we can see a straight string with tassels on both ends, a loop of ten large beads, and several loops that look like they have approximately twenty to fifty beads apiece. Holding just such a loop over his arm is the man shown at right in a detail of Rodrigo de Osona the Younger's "Adoration of the Magi" (ca. 1500). 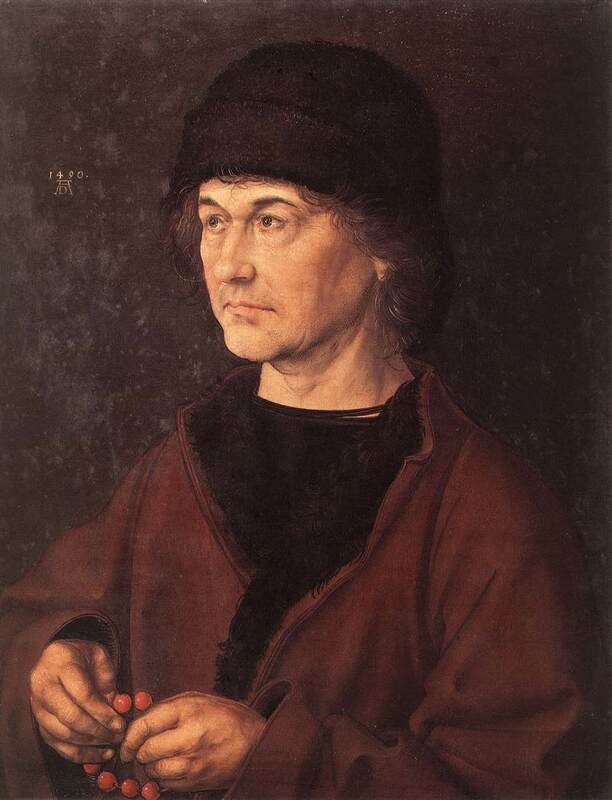 Once you begin looking, it's surprising how often rosaries and paternosters turn up in medieval and Renaissance paintings and drawings. 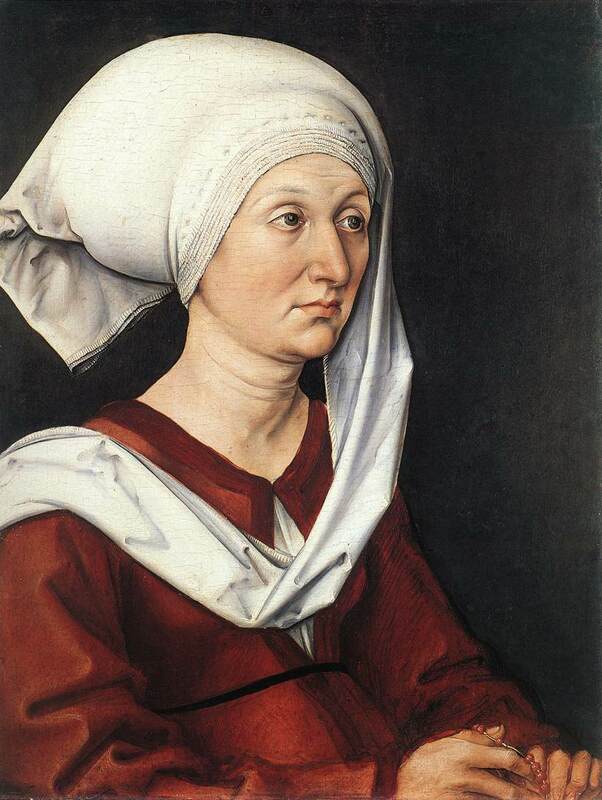 Many people had their portraits painted holding beads, including both Albrecht Durer's mother and father, young Margaret of Austria (the ten-year-old daughter of Emperor Maximilian I), and Philipp von Rhein zum Mohren. A plain loop of beads, often ending in a tassel, seems to be the "default" way that paternoster beads are shown in woodcuts and other simple illustrations. In the woodcut illustration of Judgement Day, most of the visible "good guys" on the far left are holding such loops of beads, while none of the souls on the right have any. (These seem to be in Purgatory, not Hell, since one is about to be pulled out by an angel.) Over the heads of the saved, an angel hovers with a garland of roses (alluding to the rosary) while Mary watches from the clouds. At center, another angel carries another soul (pictured as an infant) up to God the Father, who already has his cloak full of them. Woodcuts on the Paternoster-Row home page show similar loops: for instance the people kneeling at the foot of the Virgin Mary's throne (and Mary herself has a matching one), Saint Dominic, and the monk in the illustration of the legend.